If you are considering the latest Apple Watch, you most likely fall in to one of three camps. You either own the previous generation Apple Watch Series 3, an earlier model Apple Watch, or you don't own an Apple Watch at all. Let's take a look at each of those scenarios. To go with is watchOS 5 -- by far the most impressive OS yet. It helps performance, introduces new watch faces, goes a long way towards improving Siri, and so much more. If you were an early adopter to the Apple Watch, you know some of the imperfections that are present. The devices were slow, with somewhat cramped screens, and didn't exactly know their purpose. Health-wise -- fall detection, heart rate monitoring, ECG, and new workouts included on the Series 3 or with watchOS 5 are all improvements. What should you do? Upgrade! Early Apple Watches were very slow devices, and the earliest don't even support watchOS 5. Jumping on the Series 4 will be a major upgrade. One of the most difficult positions to be in is that of just picked up the previous generation. Apple Watches aren't cheap, so it can be a tough decision on whether to upgrade merely a year later. First, this is the first redesign to the Apple Watch. Larger display, better speaker, health improvements, new Digital Crown, all are tantalizing reasons to trade up. This isn't a minor spec bump that is incrementally faster, but a overall reworking of the hardware. Second, the third generation Apple Watch is still an excellent device. It has held its value well and will be easier to flip on the second hand market to upgrade to that new, shiny, Apple Watch Series 4. This also happens to be the boat that I'm in. I can tell you why I'm upgrading, which is primarily that new display and the improved cellular connection. For something I use every day, and rely on more and more, I want to be able to get the most out of it. What should you do? How important is the new screen? If the screen isn't a big deal to you, go ahead and hold off for another year. Decide on picking up tthe new Apple Watch? Check out the AppleInsider price guide to find the best deals. Yes. Yes, I should, and am. Series 4 arriving on friday ... upgrading from 3 lte. If the new screen were the only consideration, I wouldn't necessarily make that a major priority. Yes the larger active display area is nice, but it's really not that dramatic, and the trade-off is a slightly larger case (again not a major increase). To me the real value lies in the new EKG and fall detection abilities. If I were someone in this category that needed those features, I would choose the Series 4 in a heartbeat (no pun intended). My mom is definitely going to get the Series 4, whether I upgrade or not. A byproduct of the larger active display area is that it means it will also be easier for my mom to use, with her aging eyes as well. So it's win/win. For me, however, I have no heart issues, and am not prone to falling, or putting myself into situations where I'm alone and could fall accidentally. And I don't need a larger display for my eyesight. So to me, it's purely a cosmetic upgrade, especially for the minimal increase. Now, if I really needed 8 complications at a glance on my wrist on a regular basis, then maybe I would see the utility of having the larger display. But as it is, it's not yet a compelling upgrade for me. 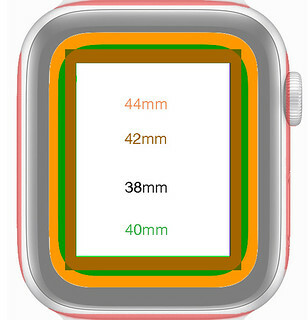 That said, given the ability to use the watch without an iPhone around, means that the user is going to rely on the display moreso that with the iPhone around. So that would be a major consideration if someone wants to leave the phone behind more often -- I'm just not sure how much better the experience would be given the nominal increase in display area to be worth the upgrade at this juncture. More than anything, the watch makes me feel like I'm living in the future on some sci-fi program, and it's well worth the price. I'll keep buying new ones as long as the improvements come this fast and furious. I have a Series 0, so pretty much a no brainer if I base it on features/specs. However, my Apple Watch still meets all my needs and looks great. Tough decision. In reality, if I do upgrade, it will be for the looks. The polished stainless steel, the display, the watchfaces not available on the older watch. Does anyone want to venture a guess as to when this will be available on Amazon? I have enough gift cards for one..,. Yepper. But I will be shopping a deal in the coming weeks/months, rather than pre-ordering. 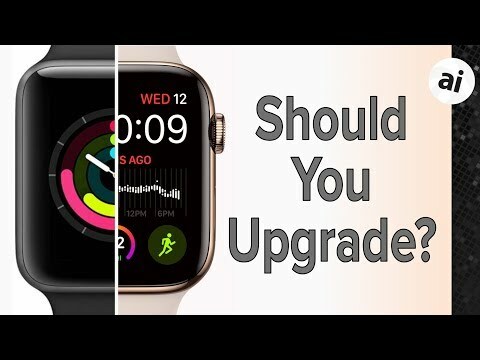 The most compelling reason to upgrade is the one that Tim Cook is too embarrassed to mention: If you upgrade you will have two watches! You can wear one at night while the other is charging, and vice versa - an elegant solution to the number one complaint. Would saying "hey Siri, start a workout" kill the mood? Can someone enlighten me as to whether the modern Apple Watches utilize sapphire crystal for the face, or just glass? I recall that previous editions offered a choice depending on the model. I can't seem to find this info on Apple's website. My contrarian view is, even for those who have the money is to just say no. Unless you have heart issues or are older and prone to falling or live alone, you just don’t need the latest and greatest Apple (or any other company’s) products all the time. Enjoy what you have. Even Buffett lives in a modest house and drives an old car. Give some of it away and bank the rest. Personally, I am going to donate $500 to charity this month instead. I have a four year old SE IPhone, that I am upgrading to an XS arriving tomorrow now that I know the SE is dead. That’s all I can agree with you on. This week, I bought a Tesla Model 3 performance, that I am upgrading from a 2006 Toyota. Saying no just gets boring over time. I’ll also upgrade my iWatch 3 as soon as I pick up my Tesla delivery in Miami next week. Great point, but Buffett will be dead any day now, and my excess won’t stop me from giving to charity. I’m an older man without heart issues and I can’t justify $608 for a series 4 when I just spent $500 a year ago for the Series 3 LTE. I’ll buy a Series 5 next year. Meanwhile my new Gold 512GB iPhone Xs Max is arriving tomorrow via FedEx. Been hanging onto my 7 Plus for two years. So it looks like I’m going to alternate each year between a new iPhone now and a new WATCH next year and so forth. With watchOS 5, it will notice you’ve started your workout and tap you to ask if you want to record it. The number one complaint of people who don't own the watch. I put the watch on the charger when I get in the shower in the morning. By the time I put it back on, I'm at 100% and good until I put it back on the charger the following morning. I was camping last weekend and didn't need to charge it until the second night. And even then I was at 38%. Gen 0 owner. Should I upgrade? YES, and I did. Mine will be delivered mid Oct, a long time of waiting. Right. And it allows you to have two different looks and finishes to change it up every now and then, and coordinate with your clothing — even more so if Apple gives us a choice of round or thinner in the future. It’s a great idea to have a watch ready to go to the gym when you get home in the event you had a busy day on the watch and ran the battery down — this will be especially true with the series 4 given the walki-talki feature and the incentive to leave the iPhone behind more and more often. You never hear to worry about it is the thing, whether the Apple Watch maintains its charge for a full day or not. And forget the gym or sleep tracking — let’s say you come home from a long day at the office, and have to head out of town for the weekend; well you’ll have a fully charged watch waiting for you to start your trip, and get you a lot further in the event you forget your charger, which switching watches should help you remember. No you don't. Even if you had bought an SE on the day it launched (March 31, 2016) it would be just less than 2.5 years old. Even the A9 chisp that is in it which debuted in the iPhone 6S, is now "only" 3 years old. I don't know why everyone keeps dumping on the SE like it is some ancient piece of tech. It is older for sure, but it is 2 whole generations (counting by the A9 chipset) newer than the oldest iPhone that is compatible with iOS12. Apple will likely support it with iOS13 as well (based on track record) which means 2 more years (Sept 2018-Sept 2020) of serviceable life. TBH, I would have been preordering its successor had Apple made one, but they didn't. Since my wife really prefers a smaller phone, we have decided to stay with her SE for now since it is still supported and perfectly usable (especially with the improvements seen from iOS12). Of course YMMV, but let's stop the whole "my SE is completely useless now that it is 100 years old" meme. I went from a Series 0 to a Series 1 and saw a very big improvement in speed and useability. For most things the improvement was intangible but it just made for a much more pleasant experience. For running however it was very real, tangible improvement where i didn't have to wait for the screen to refresh.